Hi guys! Polish Pickup starts this Friday, and I have a couple more polishes to show you. As a refresher, October's theme is Villains. Pepper Pot Polish was inspired by Annie Wilkes (played by Kathy Bates) from the movie Misery, adapted from the Stephen King book from the same name. I never read the book, but I loved the movie. I've watched most of Kathy Bates' movies, and I still enjoy her on American Horror Story. Polish Pickup starts this Friday, Oct. 5th at 11 AM EST and ends at 11:59 on Monday, Oct. 8th. This one will retail for $11, and has a cap of just 80 bottles. I can see this one easily selling out, so I suggest putting your order in as soon as possible. I'm Your Number 1 Fan is a murky olive green crelly base with orange to blue aurora shimmer, and rainbow iridescent flakes. I used 3 thinner coats for full opacity, but you may be able to get away with 2 depending on your application and/or nail length. It practically applied itself, and dried with no texture. 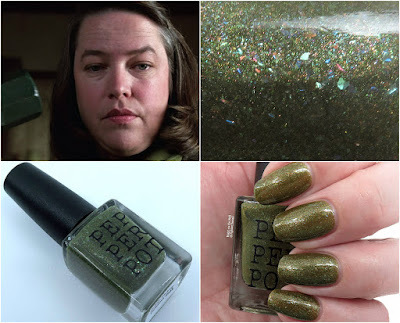 I'm Your Number 1 Fan is the perfect earthy green for this fall. I love the depth and softness the flakes add. With a cap of only 80 bottles, you may need some ninja fingers to get this one. Make sure to set your alarms for 11:00 AM EST this Friday to get yours. Find out more information about Pepper Pot Polish on their website, Instagram, Facebook, or Facebook Fan Group while you can find more about PPU on their Facebook page and website.